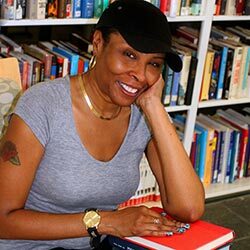 Lasonia has attended Literacy Services on and off since the mid-1990s to help her achieve various educational goals. As a working mother with two young daughters, Sophia and Crystal, she wanted better occupational options. Her first stretch at LSW helped her improve her reading skills. Lasonia returned in the late 1990s to further strengthen her skills, and she brought school-aged Crystal along to participate in the Family Literacy program. Lasonia found the atmosphere at Literacy Services to be friendly and welcoming, and she noted that the helpful, positive environment played an important part in her studies. “The one-to-one learning was the thing, it was very helpful,” she said. Lasonia and Crystal were well known at LSW; twice weekly while Lasonia studied with her tutors, young Crystal also received literacy instruction from a pair of big-hearted tutors, even though LSW didn’t have a formal program for children. Lasonia was proud of her accomplishment but she realized, however, that setting this good example for her daughters was equally important. Lasonia was very conscious that she was a role model for her daughters, and she wanted them to see their mother studying and continuing to learn. During and after her time at LSW, Lasonia made sure that her daughters knew how important it was to graduate high school. They both did. Sophia is now working in the field of home health care, and Crystal is a senior at Alverno College. Lasonia has taken a number of college courses, and she has decided to pursue her two-year degree. “When I started at the literacy center, I thought high school would be enough, but now I know it’s not. Not in this job market. I’m 48 and not getting any younger, and I know that I need to get a college diploma too.” She plans to take office technology classes at MATC in fall of 2015. Lasonia recalled her time at Literacy Services fondly, and she continues to be thankful to the tutors and staff for the education and support they provided, which made a lasting mark on her life and the lives of her daughters.